I love trying out new food. Whether it’s new ingredients, new recipes or a new restaurant. I love the exchange of ideas and new trends that can come from eating out. 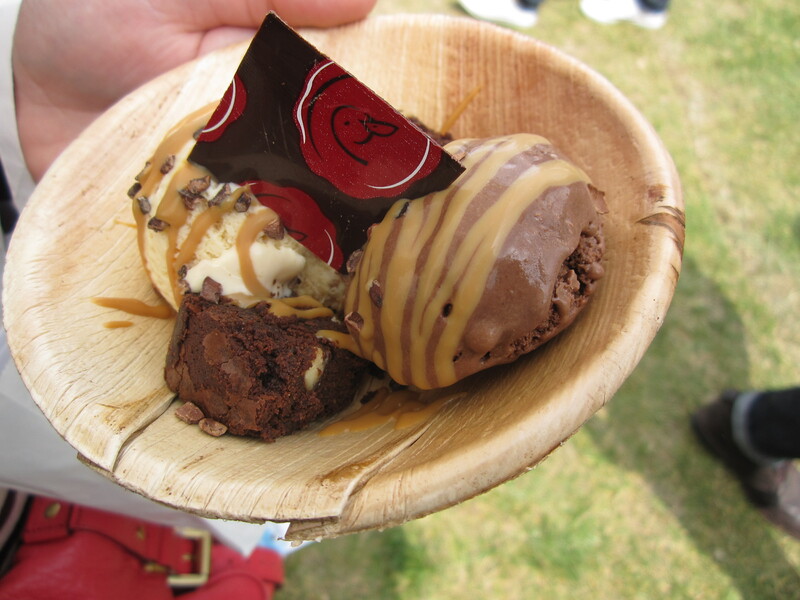 That is why I try to go to the Taste of London Food Festival every year. I first went in my last year of university and fell in love with the idea. A food festival that brought together some the best restaurants in London and around the world, where you can try iconic dishes for a snip of the price. Based on tapas size portions in exchange for Crowns (the festivals currency, about £1 for 2 Crowns) allows you try all sorts of food and drinks in one day, which I challenge anyone to not get passionate about good food whist attending. My lovely cousin, who I’ve recently been doing a lot of cookery courses with ( Cupcakes, Brownies and Easter Eggs) came with me,which meant the day before a spreadsheet was created with all the restaurants exhibiting at Regents Park that day, with their menus so we could form a plan of action as to what food we wanted to not miss out on! Can you tell we’re related?!? First stop for breakfast was Maze. Part of the Gordon Ramsay group, with French and Asian influences, however we went for a breakfast ice cream. “Red Whippy” red velvet Ice cream & waffle cone, was quite the way to start the day. 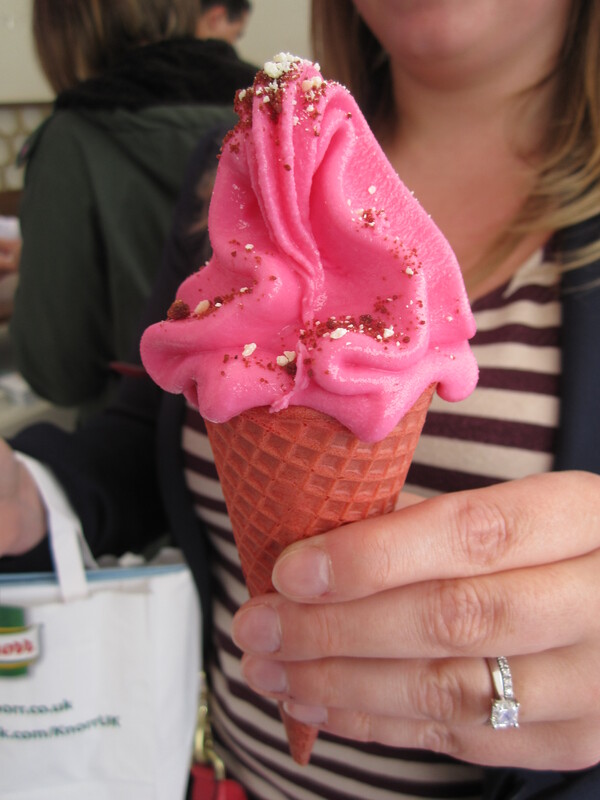 A vibrant fresh ice cream and red cone topped with cake crumbs and white chocolate. It was nice and not overly sweet, silky smooth ice cream. If I was to be critical, I didn’t think the ice cream had a huge amount of flavour, but delicious none the less. We next on barked on a meaty voyage, which I fully embraced. Quite a few of the restaurants were offering some form of pulled pork, which is totally fine by me, you know I love me some pulled pork. On our list of restaurants to try when visiting London generally was Barbecoa. A part of Jamie Oliver’s restaurant and fairly new, barbecue steak house with a menu that will have you drooling on your keyboard and reached for the bbq sauce to guzzle down till you can get a table. 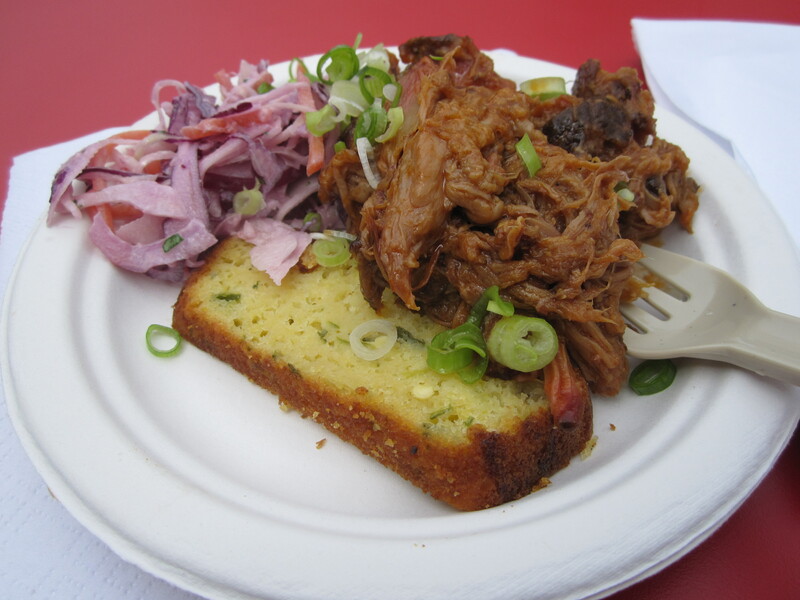 We went for the Pulled Pork shoulder, Jalapeño corn bread, BBQ Sauce & Coleslaw. 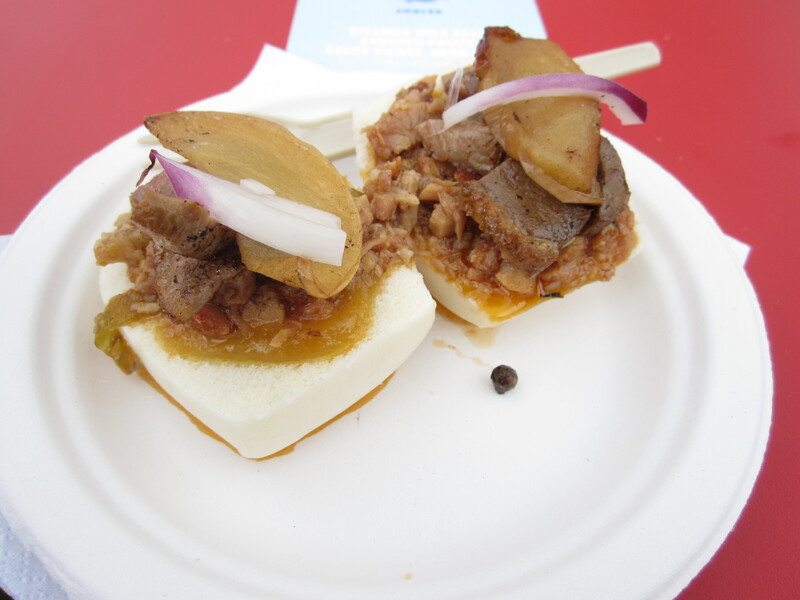 This won the Best Pork Dish of the Day for us and made us want to go to the restaurant even more. Sweet, smoky pork that just fell apart when you looked at it. We inhaled this plate of food. The cornbread had warm from the chilli and was perfect to mop up the delicious sauce and pile on the crunchy ‘slaw. 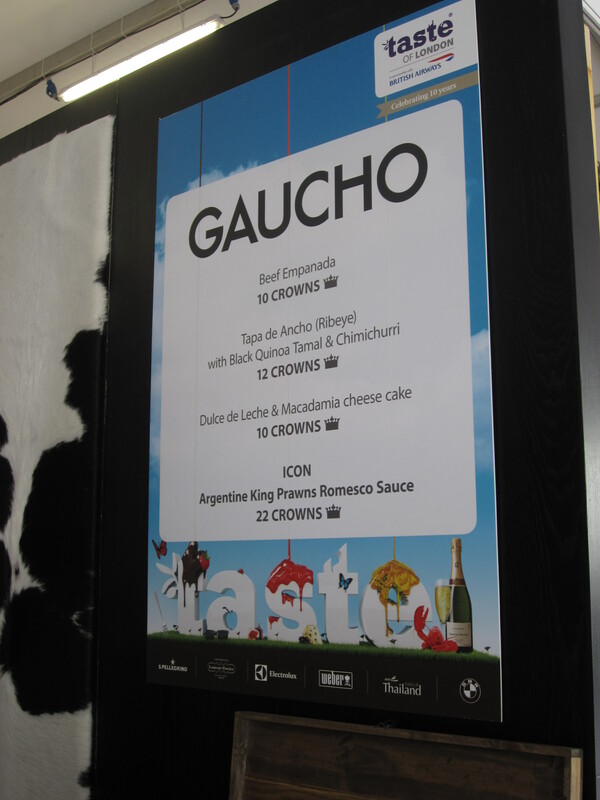 Moving on to another iconic London restaurant, Gaucho. Another restaurant on my long list to pay a visit as I had a fantastic meal from one of their sister restaurants CAU in Amsterdam last year and been wanting to try out one of their juicy steaks ever since. Their menu looked amazing but there was only one thing I wanted from them – Tapa de Ancho (Ribeye) with Black Quinoa Tamal & Chimichurri . Cooked to perfection, I love my steak rare (a true Cavewoman! ), this steak was flavoursome and cut like butter. The richness cut with the freshness of the Chimichurri sauce. 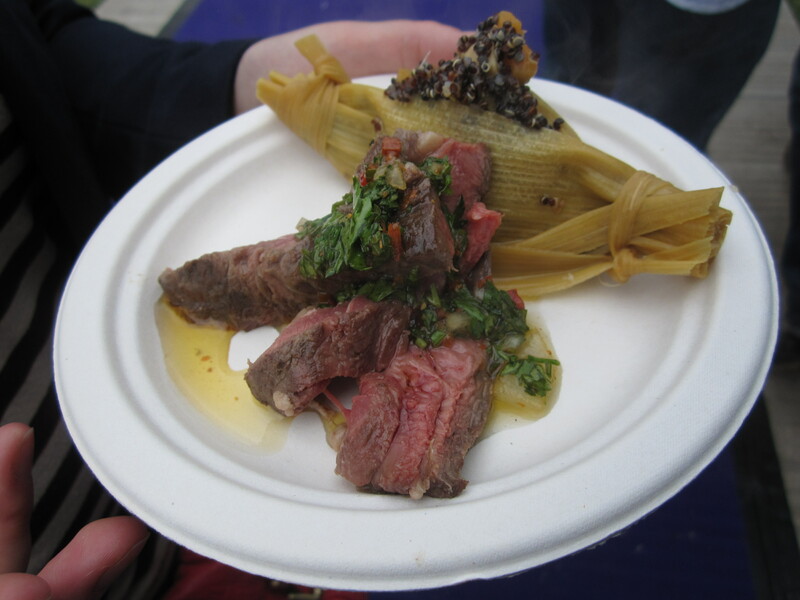 The black quinoa tamal was nutty which again worked so well with the steak. Taste of London also has a large Taste of Thailand section which for someone who loved travelling around Thailand and Thai food is an absolute bonus! 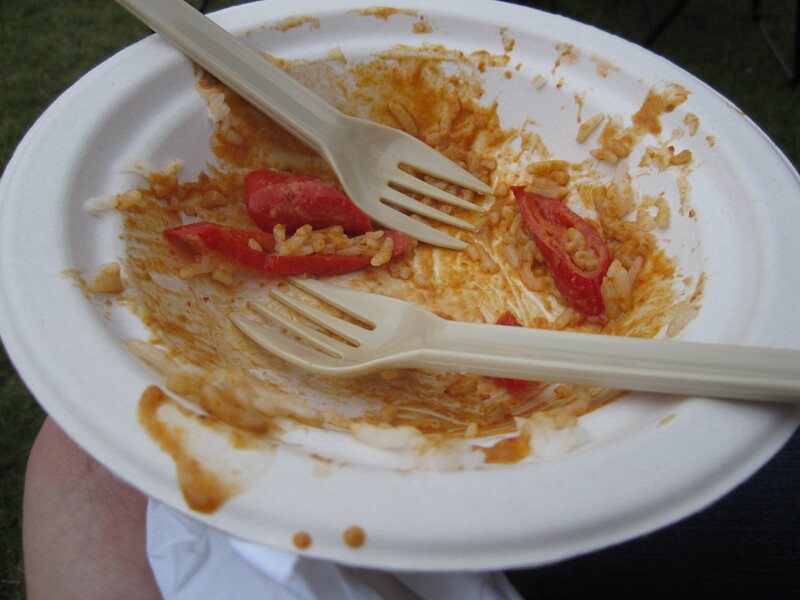 We took a break from all the walking around and parked ourselves in a deck chair in front of the entertainment stage with a steaming bowl of Duck curry from Mango Tree. 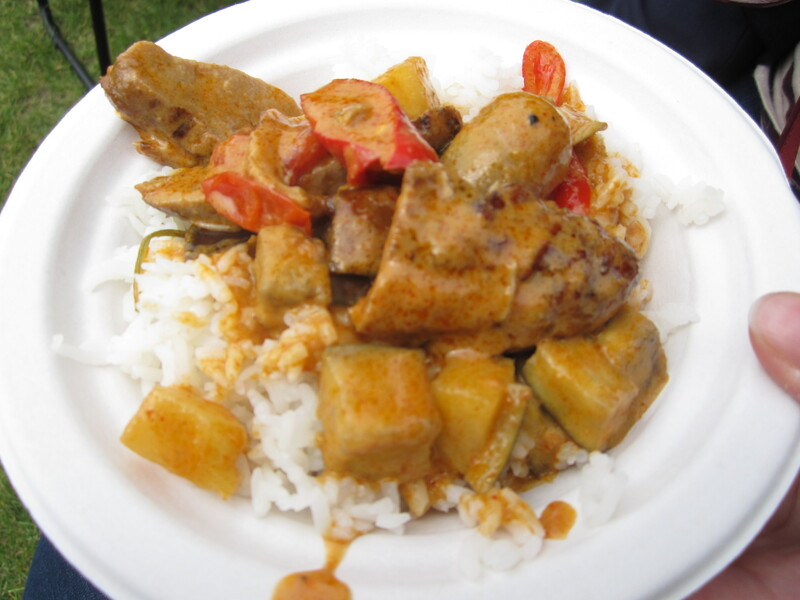 The full dish title was Gaeng Phed Ped Yang Pon La Mai or Red curry with roasted duck, grape, pineapple and cherry tomatoes with steamed jasmine rice. I had never had cooked grapes, but they really worked with the richness of the duck. I only realised when writing up the post that I had actually visited the restaurant in Belgravia for a friends birthday, where we had a fantastic meal and cocktails. This dish really brought back memories of being sat on the beach staring out at the turquoise sea with a fragrant curry on my gap year. The next dish was the Dish of the Day for us. So much so we shared the first plate, then when our last crowns went back to get a plate each. Perfection on a plate comes from Graffiti all the way from New York. This makes me sad that we had a dish so brilliant and can’t just pop to London to pick up some more. But on the up side I now know one restaurant I’m definitely trying next time I’m in New York. What was the dish I hear you cry that rocked your world so much? Charred Bacon Duck Buns. Super soft and slightly chewy white cloud of a Pau dough steamed, sweet apple sauces topped with peppery slices of tender duck and nuggets of salty bacon, and soft pan fried apple slice meant we were in heaven. I wonder how well they can be posted from New York?? 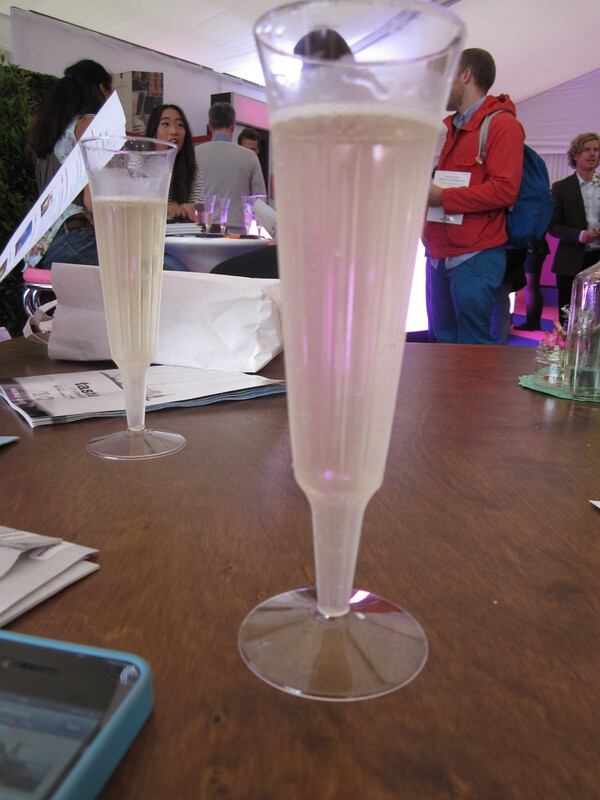 We took a little breather from all the delicious food and to savour the duck buns and moseyed to the V.I.P tent to get our complementary glass of champagne, whilst jazz tinkled in the background. It really was a hard day but hey someone has to do it! At this point the spreadsheet was referred back to, plotting a route of where we had yet visited and how many crowns we would need to finish up our pilgrimage. There was still many places. Back in January I wrote a post of one of the best restaurants I had tried out in a long time. The Duck and Waffle. It was love at first pig ear! 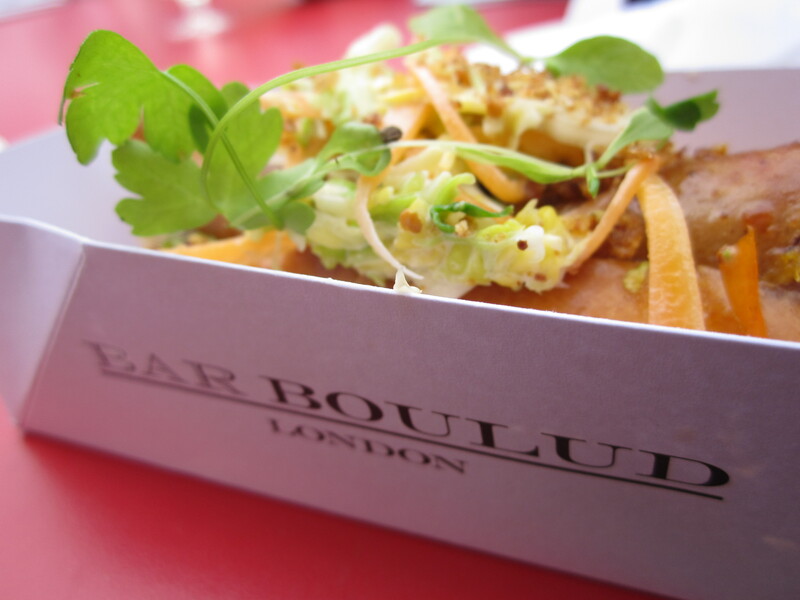 And they were on the menu as well as their iconic and very very moorish ox cheek doughnut. We were a bit meated out at this point even though I could eat the BBQ pig ears and doughnuts all day long, we went for the Dark Chocolate Brownie with Peanut Butter Crunch . Dessert of the Day! Both me and my cousin are addicted to peanut butter and chocolate so this was awesome. The peanut butter crunch was nestled under the silky smooth peanut butter ice cream which I never wanted to end. Paired with a dark rich chocolate ice cream, a sprinkle of chocolate nuggets and caramel sauce, what’s not to like. And the brownies – oh boy the brownies. Nom – I’m a huge fan girl! Asia de Cuban was our next stop, last time I tried their food I had the Mexican doughnuts were such tasty little morsels. 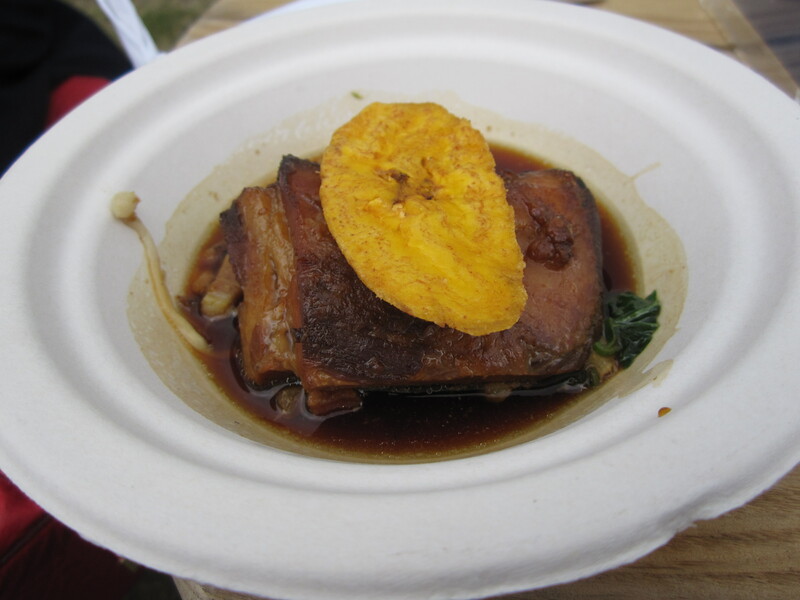 This time we went for the Honey-Rum glazed Pork Belly, plantain Maduros, Shanghai bok choy and Enoki mushrooms to try. Again the pork waas beautifully tender with the sweetness working with the meaty mushrooms and tender bok choy. Tasty little dish, only low point was the plantain was very dry to the point of not being nice to eat. But the dish still worked nicely. Lastly on our spreadsheet before we headed back for more Duck buns was at Bar Boulud . I had seen rave reviews about their burgers and well actually all their menu. All day we were seeing cute little hot dogs that we knew we had to try for ourselves. 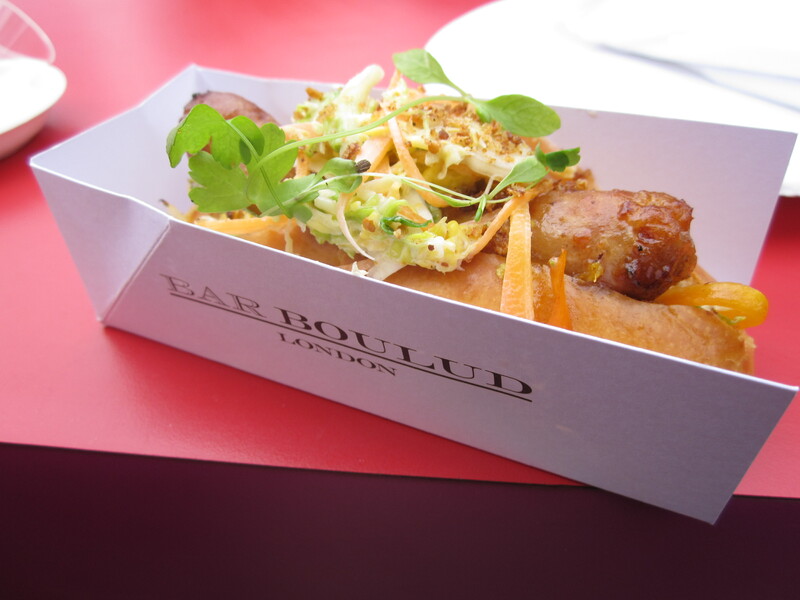 Somerset Hot Dog – Cheddar and Pork Sausage, Cumberland glaze and Savoy Cabbage. Cheddar in the sausage is probably my new favourite thing, paired with the savoury cabbage – wow. In a warmed brioche sweet bun , the sticky porky glaze and freshness of the salad topping had use make many appreciate sounds. No barbie is going to be the same this summer, to match up with these dogs. We had an awesome day and managed to get a last portion of Duck Buns before the heavens opened and we scampered to the tube very full and very happy. Bring on next year! In the Name of Science..well sort of!